I’ve heard it called clustering, spider-webbing, and mind-mapping, but whatever you call it, it’s my favorite pre-writing exercise. Like many, I don’t think in outlines. 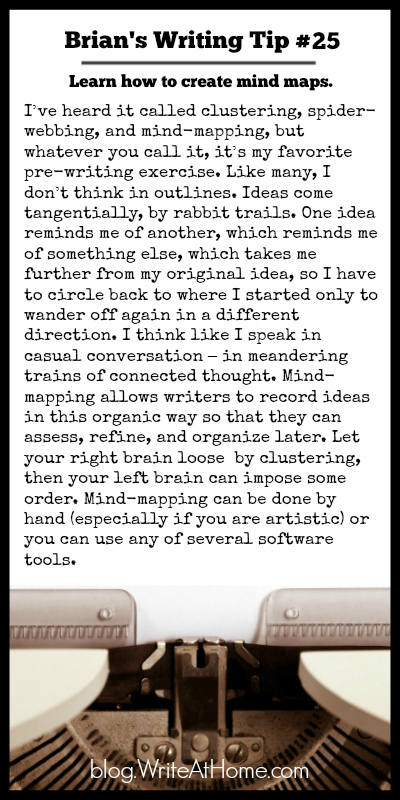 Ideas come tangentially, by rabbit trails. One idea reminds me of another, which reminds me of something else, which takes me further from my original idea, so I have to circle back to where I started only to wander off again in a different direction. I think like I speak in casual conversation – in meandering trains of connected thought. Mind-mapping allows writers to record ideas in this organic way so that they can assess, refine, and organize later. Let your right brain loose by clustering, then your left brain can impose some order. Mind-mapping can be done by hand (especially if you are artistic) or you can use any of several software tools.